Wondering where the best places in Milledgeville are to rest those weary feet? Look no further. Whether you want to unwind with a good book, chat with the locals or just sit back and soak in some of Milledgeville&apos;s beautiful history; our porches are a force to be reckoned with. The Antebellum Inn: The Antebellum Inn is a unique bed and breakfast located in the heart of Milledgeville. It&apos;s a Greek revival style home, with a wrap-around front porch that overlooks one of Milledgeville&apos;s main roads, North Columbia Street. With ferns hanging all around, and a dozen large rocking chairs, the porch of the Antebellum Inn is a nice place to unwind after a long day exploring Milledgeville. 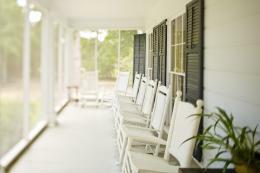 Guests at the Antebellum Inn can enjoy meals and cocktails on the front porch, while overlooking the beautiful gardens that surround the property. The Antebellum Inn is a great place to take your sweetheart, family member or even yourself, if you&apos;re looking for an escape from everyday life. 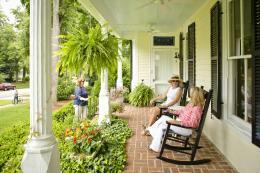 The porch is just one of the unique experiences at this beautiful bed and breakfast. If you would like to experience this porch and the magnificence of a good night&apos;s sleep, please contact The Antebellum Inn at the information below! 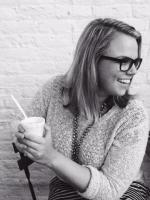 Andalusia: While you&apos;re visiting Milledgeville, a must see is Andalusia farm. Flannery O&apos;Connor lived on the farm from 1951-1964, and sat on the same porch that is open to visitors now. The Andalusia farm porch overlooks rolling acres, where peacocks, deer, wild turkey, red-tail hawks, beaver, raccoons, foxes and other aquatic beings reside. The farm sits on 544 acres and is a great place to visit with family and friends. The Andalusia farm porch is a great place to make memories and learn about Flanner O&apos;Connor&apos;s lifestyle and to see where she gained the inspiration that makes up her writing. For more information on Andalusia, please visit them at the information provided below! 2628 N. Columbia Street, Milledgeville, GA 31061. *Attention, GPS users: Global positioning system devices (TomTom, Magellan, Garmin, etc.) will NOT accurately direct you to Andalusia. When entering the physical address, the guidance systems will send you to the Milledgeville Mall, which is located 1.2 miles SOUTH of Andalusia on Highway 441. As you travel north from the Milledgeville Mall, you will pass the Wal-Mart shopping center. Look for Badcock Home Furniture on the right side of the highway as you leave Milledgeville. The driveway to Andalusia is located on the left side of Highway 441 just beyond the furniture store. 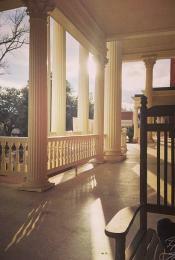 The front porches on Georgia College&apos;s campus: On Georgia College&apos;s campus, there are four main buildings that defy front campus. Bell Hall, the honors dormitory for the school, Terrell Hall, the foreign language and communication building, Atkinson Hall, the business school, and Parks Hall, the Administrative building, are all homes to some of the hottest spots on campus: the porches. Each is adorned with rocking chairs, porch swings and stools that are unique to each building. Over the years, each porch has undergone transformation as well, with the most recent being Terrell Hall. The porch of Terrell was reconstructed to stop it from sinking, as well as painted and redecorated in order to make it more appealing. On any given day, faculty and students can be seen rocking on the porches, or even hosting parties! It&apos;s a common occurrence to see large groups of people on each porch. To schedule a tour of Georgia College, please contact the information that is provided below! We can&apos;t wait for you to come rock with us here in Milledgeville!